With the clash between Russia and the West escalating in Ukraine, most tend to focus on the contemporary factors fuelling the confrontation and ignore its historic roots. The truth of the matter is that the current conflict is but a manifestation of an ancient schism between East and West that has been tearing Christianity apart for 1,500 years. The rift between the two great Christian denominations runs like a tectonic fault-line along what is known as Orthodox crescent, starting in Greece and curving through Bulgaria and Romania to Ukraine and Belarus to Russia in the north east. On the one side there are the Orthodox Eastern Churches and on the other the Catholic Church and its offshoot the Protestant Church. There are around 2.1 billion Christians in the world. Of these, somewhere between 10 and 15 per cent – estimates vary considerably - are Orthodox. Most Christians are Catholics, their number is estimated at 1.2 billion, and the rest are split between Protestantism’s 27,000 denominations. The ancient rifts between those branches are now threatening global stability and the prospect of long war. The conflict could be traced back to the 451 Council of Chalcedon, during which the great rift between Christianity’s major wings began. At its heart was the debate over the use of unleavened bread when performing the Eucharist, a rite derived from the Last Supper when Jesus broke bread with his disciples during a Passover Seder. Western Christians preferred unleavened bread, whereas Eastern Christians opted for leavened bread. The debate has escalated over the centuries and is particularly difficult to resolve today as no one is quite sure what unleavened bread is but nobody wants to admit that they were wrong. This division plagued the Church for a long time but stopped short from creating a full schism, until the debate about Christology, the true nature of Christ, took centre stage. Eastern Christians maintained the proposition that Christ has one human nature [physis] and one divine nature [physis], united with neither confusion nor division. Western Christians said the two natures were united without division but one shouldn’t rule out confusion and really Eastern Christians should learn to chill a bit. This had the opposite effect as Eastern or Orthodox Christians became even more infuriated at the suggestion. But the straw that broke the camel’s back came with the debate about the precise Calendar to use in establishing the dates of Christian celebrations. Western Christians had for years been buying the normal calendar with the pictures of cats, and pictures of cats on the snow in the winter, but Orthodox Christians said it was unseemly and they need a classier calendar. The debate about the calendar could not be settled and it finally pushed the Churches towards full schism beginning in the year 1053 and escalating with a series of ex-communications, counter ex-communications and ex-ex-communications. The sack of Constantinople in 1204 during the fourth crusade fully sealed the schism and left a scar on the psyche of Orthodox Christians that has never healed. Orthodox Christians around the world commemorate the sacking of Constantinople and Western treachery every year in a solemn religious ceremony during which they burn calendars with pictures of cats and shed tears for their slain martyrs. Catholics have for long frowned on these celebrations, what with them reminding everyone of their history, and indeed have banned them for long periods. With the collapse of the Soviet Union and the revival of Orthodox Christianity in Russia and Eastern Europe, the stage was set for the return of this historic confrontation. Many Russians, including President Vladimir Putin himself, did not forget the role that the Papacy played in the collapse of the Soviet Union and the moral support it gave to the West. Symbolically Putin insisted on being photographed receiving leavened bread, a gesture that infuriated then President George W Bush who had was famously wheat-intolerant, as well as being generally intolerant. As the situation escalated in Crimea, President Obama called Putin to discuss the situation and how to avert further escalation. Putin repeatedly insisted that Obama agree with the two natures of Christ being ‘united with neither confusion nor division’ but it was a step too far for Obama and one that would cost him dearly among the voters. The conversation broke down and Putin ordered a series of escalatory measures as a result. The conflict in Ukraine is but one manifestation of this ancient rivalry that doesn’t show any signs of abating with time. 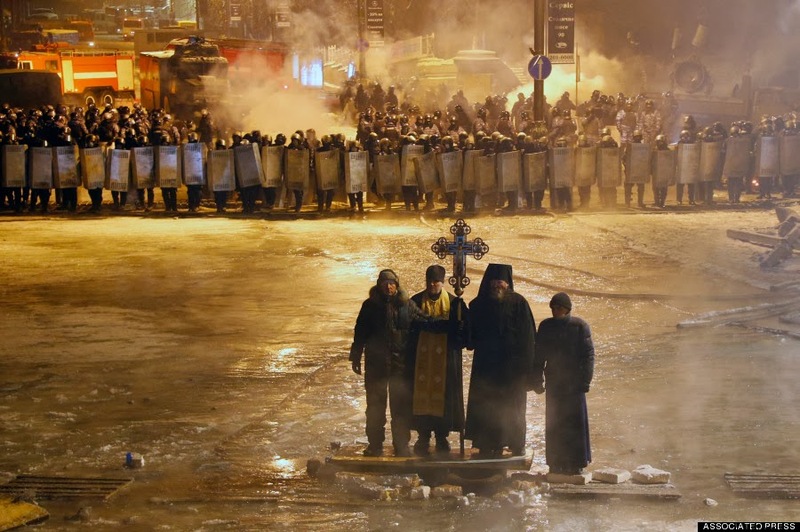 Thousands of fanatics from both sides have already poured into Ukraine driven by the ancient hatreds that have plagued Christianity for so long. German Greens, Swedish Liberals and American Republicans are united in their desire to uphold Western Christianity while on the other side Russian volunteers are expected to be joined by Armenians, Cypriots, and Egyptian Copts as the conflict escalates into a defining confrontation at the heart of Christianity. To most outsiders these disagreements about calendars and theological debates appear outdated and irrelevant. They prefer to talk instead of geopolitical and economic factors, obscuring the role of the ancient East-West schism in the process. But the reality is that Ukraine, and probably other countries too, will become the stage for a proxy war between those rival power, with Russia on the one side representing Orthodox Christianity and the US on the other leading the Western Christian alliance. Can we stop this descent into madness? Let’s pray. Brilliant! An excellent rebuttal to over-sectarianization of Middle East analysis. Hi Karl. Good to see you writing about this, it is an important issue that not many recognize. A few days ago I also wrote a piece about the influence of the Russian Orthodox Church in politics and how they are trying to use the situation in Crimea to their advantage. Although orthodox Christians have many differing view points, it really comes down to the energy makets............Perestroika. Interesting, though there is a crucial piece of this puzzle missing from your commentary- that is the Uniate Church that has bound parts of this society to Rome since the 16th century (which is to say nothing of the memory of large Polish and Jewish minorities of historically "western" nature) and Ruthenia/Ukraine's history of "apostasy" from the perspective of Russian Orthodoxy. Also the link between nationalism and nationally controlled Orthodox Churches vs. a somewhat more independent Papacy is relevant to your discussion. This is so artificial and ungrounded, you might have as well written that, in essence, this is an ongoing clash between meat-eaters and non-eaters, because for many-many years east has been consuming more meat than the west.